One of the most successful exhibits of all time - more than 10 million people around the globe have viewed Bodies The Exhibition in the past decade. Operated by Premiere Exhibitions, the attraction is currently in nine locations worldwide, including Las Vegas. First opening at the Tropicana in 2006, Bodies moved to The Luxor Hotel & Casino in 2008. The 36,000-plus-square-foot exhibition space showcases 13 full-body specimens from China and more than 260 organs, body parts and partial body specimens. Using an innovative processing known as polymer preservation, which prevents the tissue from decaying, the body parts are displayed in a way that allows visitors to see the actual inner workings of the human body. The exhibit is arranged according to the systems of the human body, starting with the skeletal system and moving on to the more complex regions, including digestive, nervous, circulatory, respiratory and muscular systems. With nine galleries total, the most sensitive element of the exhibit is the fetal gallery. Located in a private section of the exhibition space, guests can view different stages of a baby’s development as well as fetuses with various birth defects. Another room illustrates the effects of disease and poor lifestyle choices with side-by-side comparisons of a smoker’s lungs and a non-smoker’s lungs and a healthy liver next to a liver inflicted with cirrhosis. Cheap Las Vegas Bodies The Exhibition tickets also offers visitor’s valuable information on ways to prevent disease and improve the quality of life as well as several fun facts along the way such as the nervous system, which is responsible for processing all thoughts and emotions, is faster than the world’s most powerful computer and the human body has more than 100 miles of blood vessels. Get your Bodies The Exhibition tickets from VEGAS (the app) today for a fascinating and educational experience that is fun for the whole family. 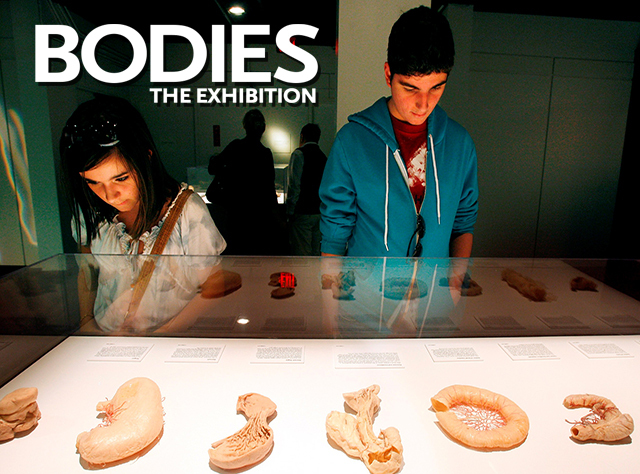 Bodies the Exhibition is open daily from 10:00am – 10:00pm. Last admission to Bodies the Exhibition is at 9:00pm. All ages are welcome to Bodies the Exhibition. You may take you time to explore Bodies the Exhibit, Please allow at least 1 hour to completely view Bodies the Exhibition..